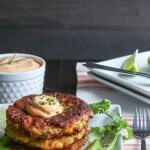 Topped with chipotle lime cream, pan fried Roasted Corn Zucchini Fritters with Chipotle Lime Cream are stuffed full of late summer veggies and make a satisfying vegetarian main. They're freezer friendly too! vegetarian + optionally dairy free and gluten free *See update in notes for a major short cut to this recipe! *See update in notes for a major corn short cut to the following original recipe below! Preheat oven or toaster oven to 400F. Wrap the corn, husks on, in aluminum foil. Roast corn for 1 hour. Grate the zucchini on a box grater, microplaner or in a food processor fitted with the coarse shredder. Working in two batches, place the grated zucchini in a kitchen towel and squeeze, draining over the sink. Continue squeezing and pressing hard to get as much of the liquid out of the zucchini as possible. Set aside. Dice the poblano and onion into small dice. In a saute pan, add 2 tsp coconut oil. Heat oil until it shimmers. Saute the poblano and onion on medium heat for about 8 minutes. Stir occasionally. The onions will become soft and the poblano should get a bit of charring on them. This will bring out their flavor. Meanwhile, mince the garlic and place in a large mixing bowl. Remove the onions and poblano from heat and place in the large mixing bowl with the garlic. Add the drained zucchini. Set aside. In a small bowl, mix the masa, all purpose flour, baking soda, 3/4 tsp salt and pepper. Set aside. In a measuring cup, mix the milk and 1 Tbs Apple Cider Vinegar (or use buttermilk). Wait 5 minutes (this allows the milk/vinegar mixture to sour) then whisk in the egg. Set aside. When the corn is finished roasting, remove it from the foil and allow to cool. Remove the husk and cut the wide end off. Carefully, cut the kernels off the cob by placing the wide end perpendicular to the cutting board and glide the knife down the cob removing the kernels. Place the kernels in the bowl with the zucchini/pepper/onion mixture. Mix well. To the zucchini mixture, add the flour mixture, mix well. Add the milk mixture and stir so that all the ingredients are throughly incorporated. Preheat the oven to 350F and line a baking sheet with SilPat or parchment. The fritters will be baked briefly after pan frying. Add about 1/8" coconut oil to a skillet. Heat until oil shimmers on med high heat. Use a 1/3 C dry scoop to portion out each fritter and use a spoon to help you get the fritter out of the scoop and into the pan. Use the back of the dry scoop to press the fritter to about 1/4" thickness. Cook on each side for about 2-3 minutes on med to med high heat. Remove from pan and place on a paper towel to drain. Sprinkle with a pinch of salt. Add more oil to the pan as needed to finish frying all the fritters. Place the fried fritters on SilPat or parchment lined sheet pan and bake for 15 minutes. Remove from oven, serve with garnishes and chipotle cream. In a food processor add the sour cream, chipotle pepper, adobo sauce, sugar, salt and lime juice. Process for 20 seconds, then scrape the bowl down. Process for another 20, scrape down the bowl again. Process for a final 30 seconds and it's ready to serve. Store in a lidded container in the refrigerator for up to two weeks. *Find Masa Harina in the specialty flours section. I like Bob's Red Mill. - OR - see Lisa's note below on subbing corn meal for the masa harina! UPDATE (Aug. 6, 2018): Major short cut alert! Instead of roasting the corn in the oven, toss it in the pan with the corn and poblano with 1 Tbs (instead of two tsp) of oil for 8 minutes on medium to medium high heat allowing the corn and poblano to char a bit. Toss the corn mixture into a work bowl with the remaining ingredients and mix well! You're now ready to scoop and pan fry. It shortens the prep/cook time by almost an hour with excellent results! These fritters freeze well. Store cooked fritters stacked between small sheets of parchment paper and slide into a freezer bag. Freeze for up to a month. To reheat, thaw in the refrigerator on a parchment lined sheet pan then bake for 15 minutes in a 350F oven. Recipe adapted from Dinners Dishes and Desserts.